The adapter is manufactured in a machine shop called MICO in Weikersheim, Germany. A little correspondence with the general manager Markus and a hefty bank transfer resulted in the adapter showing up at my door about 2 weeks later. The difference in registration distance of M42 and M645 lenses is about 18mm and MICO has managed to squeeze both tilt and shift capability in this little space. The way they did this is to use a curved dovetail for the tilt part and a straight dovetail for the shift part. These two dovetails are at 90 degrees to each other and are not rotatable in relation to each other. This may seem a limitation but it really isn’t because of the clever rotating mechanism provided for the M42 mount. The adapter is hefty, all metal construction made with aluminum and stainless steel and weighs 134g all by itself. It is beautifully finished with black anodizing. 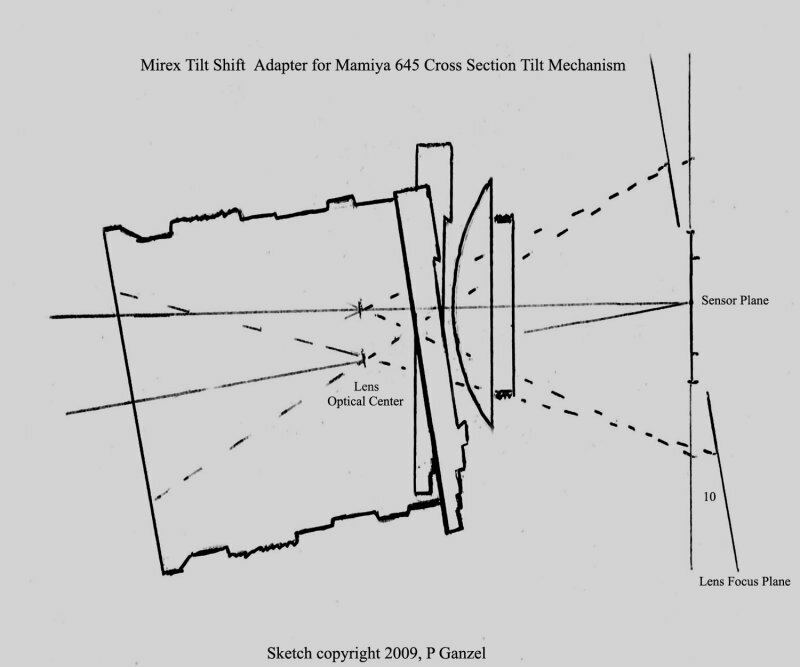 There is a standard Mamiya 645 lens mount on one end with a lens release lever on the side and a standard M42 X1 threaded mount on the other. The adapter allows correct focus to infinity with the Minolta/Sony AF to M42 adapter I use with all the lenses I tried. 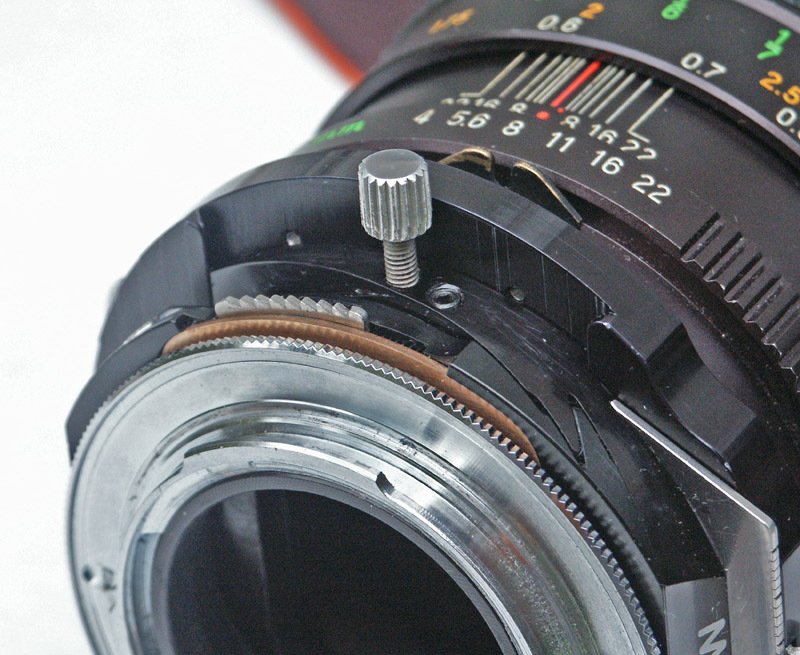 MICO also makes a Shift only M645 adapter and a T2 tilt/shift adapter for Hasselblad lenses. 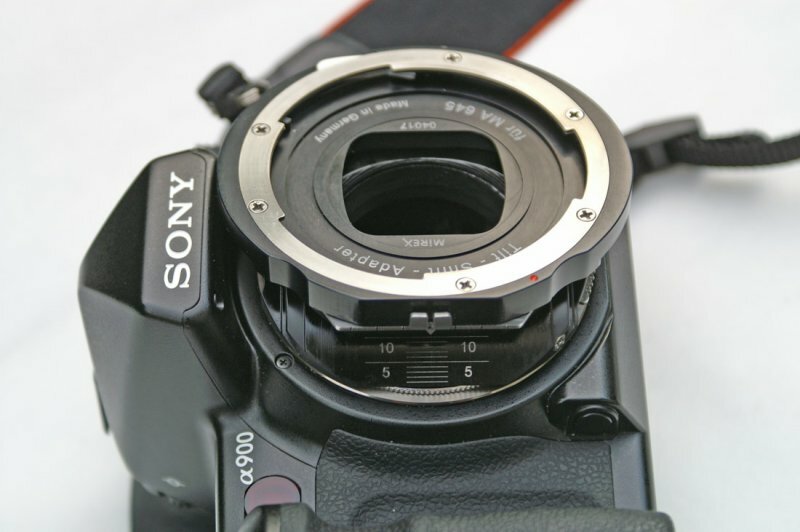 One of the clever things about this adapter is the rotating lens mount. This allows tilts and shifts in any direction. The adapter is provided with two linked spring loaded locks which mesh with a ring gear around the mount. As there are two, you can release and rotate the lens when one or the other is inaccessible. There is a series of directional milled teeth on each lock that are easy to hook with a fingernail and push to the side to release. Letting go of the release locks the mount into position. You quickly learn to use these locks by feel, though there is usually just a finger width of clearance when mounted on a camera. There are 40 divisions in the mount locking gear so rotation is in 9 degree steps. One added benefit of this arrangement is that variations in the screw mounting position of M42 adapters can be adjusted to “center” nearly perfectly. In the parlance of view camera use, a tilt is up and down and a swing is left or right. The Mirex design uses a curved dovetail that has a radius centered on the sensor, so it is exactly like the back movement on a view camera. The movement is in only one direction from the center, so to get a full range of motion, the adapter is rotated so the movement is in the desired direction. The complex dovetail is so well fitted that the movement is smooth and slightly damped and needs no control to adjust, you simply move by hand to the position you want. There is a locking screw for clamping in a specific position. The thumbscrew is tiny and partially behind the lens mount and does not work well for effective clamping. It also conflicts with the A900 prism housing in one position. I just removed the screw and have no problems except for when I put on the front heavy Flektogon which drooped unrestrained in the down position. No problem left or right with any lens. I am working on a modification of the thumbscrew to eliminate the mechanical conflict and make it easier to lock the tilt movement. A dovetail tension adjustment is provided next to the locking screw. This is similar to the “ways” adjustment on machine equipment and reduces play and provides some tension tweaking on the dovetail. The hex head screw is adjusted with a hex key which is provided with the adapter. There is a scale in degrees (0-10) on one side which can be used for all Tilt/Swing movements. It may be in a location difficult to see in some positions (as on the underside of the lens). The lens is “zeroed” to center by simply pushing the lens back to its stop because the lens only tilts/swings to one side. With the A900 horizontal, up tilt is limited to about 5 degrees because the adapter edge hits the protruding prism housing. Removal of a little material at the edge of the adapter would allow full up tilt. MICO could probably make this modification. The adapter is “stepped” back in this area, obviously for camera clearance, but is not quite enough with the A900. In reality, an up tilt would rarely be used. I envision an application would be near/ far at the top of the frame, such as a ceiling, but 5 degrees is probably enough anyway. 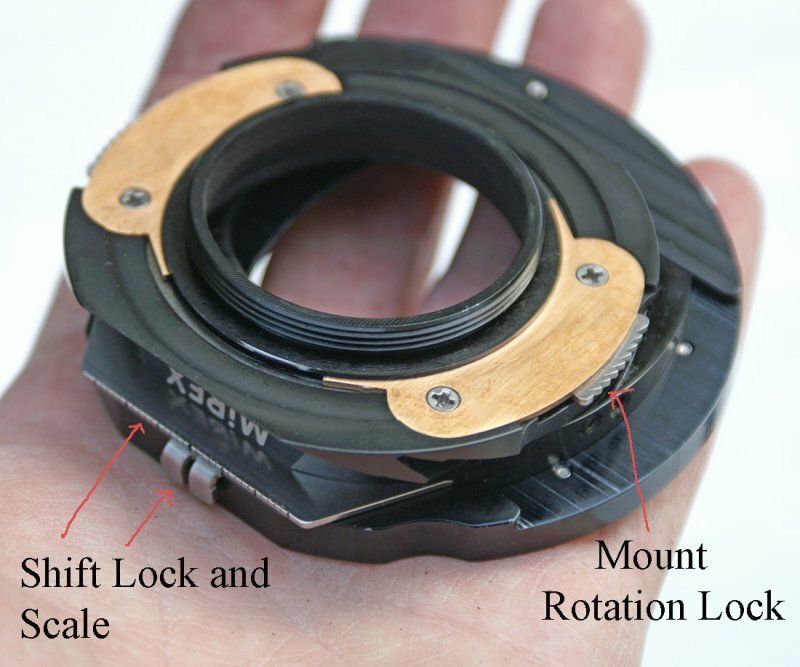 The down tilt is the most useful tilt movement and is used for near/far at the bottom of the frame such as a field of flowers in focus from macro to infinity. Down tilt is unlimited on the A900 to the maximum provided by the adapter, 10 degrees. In view camera language, a shift is movement parallel to the film plane left or right. A rise is a movement up and a fall, movement down parallel to the sensor plane. These are traditionally lens or front standard movements and are used as such with the Mirex. These movements are generally used for perspective distortion control. Typical uses include reducing the keystone effect when shooting tall buildings, seeing “around” unwanted objects and shooting mirrors directly on without the camera being seen. Wide angle stitching can also be accomplished using the horizontal shift movement. Stereo pairs can also be made with the horizontal shift. In use, the camera is held level and the lens moved parallel to the sensor plane to encompass the object being photographed. The adapter does shifts with a simple dovetail which is machined 90 degrees rotated from the tilt dovetail. This movement is controlled by pushing down on the spring loaded index tab and shifting by hand to the desired position. The lock is provided with a fine “rack” with 1mm teeth so it detents in 1mm increments. This method is quick and intuitive, much less tedious than using a lead screw used in many shift lenses and adapters. There is a mm scale indexing to a slot in the locking tab. Movement is 15mm left or right or up down. Heavier lines are indicated at 5mm intervals. The scale can either be at the top or side of the adapter depending on rotation position. There is no special detent at “ zero” so you need to look at the scale and adjust to re-center the lens. Rise/Fall and Shift are interchanged by rotating the adapter 90 degrees. Rise/Fall and Shift are mechanically unlimited on the A900 to the max provided by the adapter, 15mm in any direction. An example of a combined motion would be photographing the side of a building at an oblique angle yet retaining perspective control when shooting from a lower position. Combined Tilt/swing and rise/fall are possible with the adapter, though they are always rotated 90 degrees from each other. With the A900 in the horizontal position, with a rise greater than 4mm, swing is limited to about 7 degrees because of the penta housing. Left shift and swing with the camera in the vertical position is similarly limited. In practical use, I have not found these slight limitations to be a problem, 7 degrees is usually enough. As the radius of the swing/tilt rotates on the film plane, some adjustment of focus is necessary with movement away from center. This is because one side of the projected image will be behind the sensor plane (unless you wish to exaggerate the out of focus area). By shifting the lower edge forward to focus at a far distance, you are in effect providing extra extension on the close side. The effect is closer focusing than the normal minimum focus distance. I’m working on a table for the 35mm Sekor lens showing optimum scale focus distances with each degree of tilt/swing. 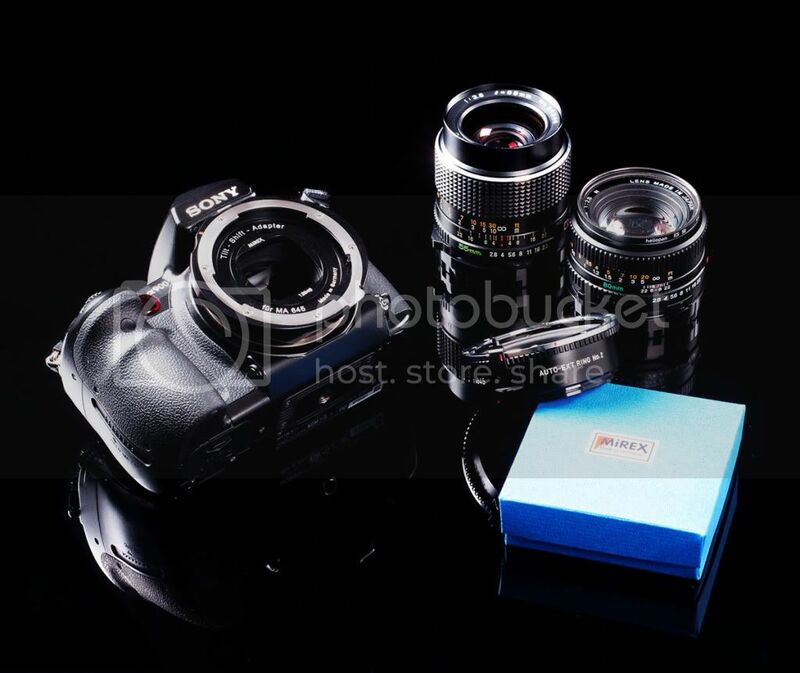 Since this adapter is used on reflex cameras, you are depending on the mirror to relay the image to the focus screen. When the adapter is tilted more than 7 degrees toward the bottom of the mirror (down tilt or side swing in the vertical position) the image on the screen becomes blanked by about 10% at the top. This is because the extreme off axis rays going to the (bottom of the) sensor, miss the lower edge of the mirror. There is no effect of this on the recorded image, only what you see in the viewfinder. You just need to be aware of what is happening and ignore the apparent “cropping”. This viewfinder vignetting also occurs with APS crop bodies. It is not really a fault of the adapter, just an artifact of how reflexes work. Neither the adapter nor the A900 mirror box appears to limit the image projected to the sensor in any position. 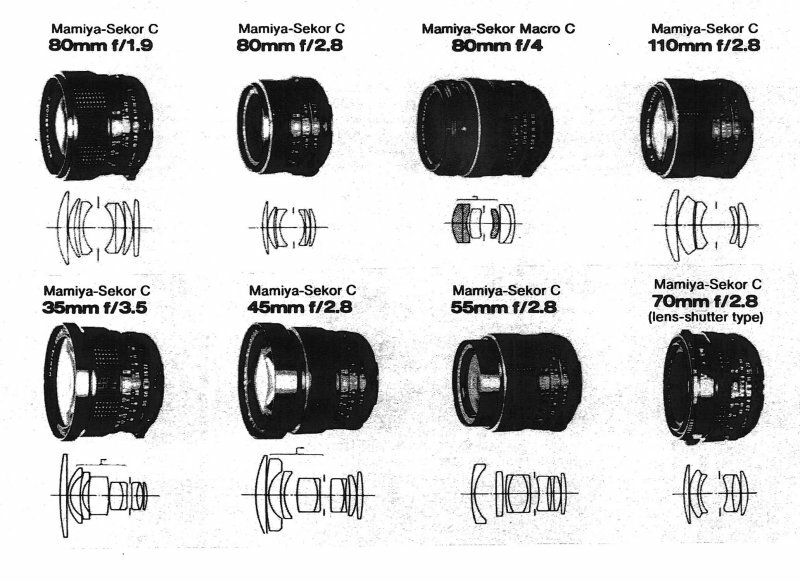 Mamiya 645 lenses have an image circle of more than 75mm. 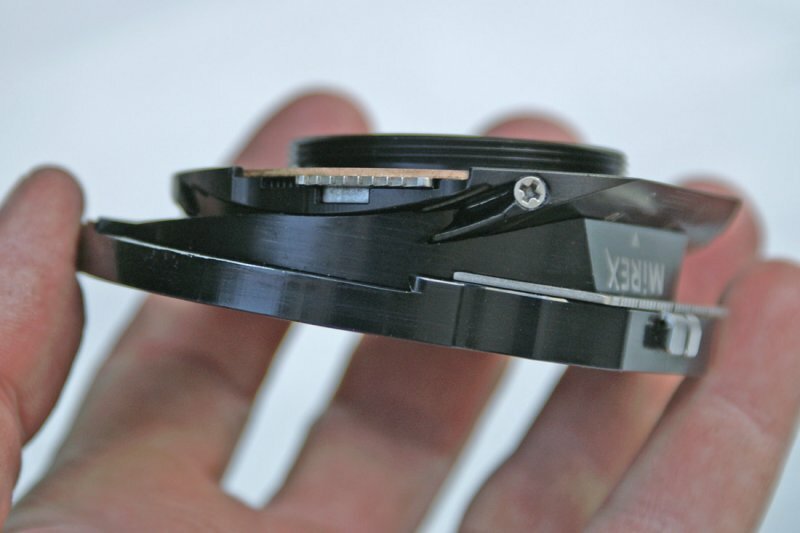 All motions provided by the adapter and full frame sensor fit within this circle. The Mamiya 35mm does have a natural fall off of about 1 EV from center to edge, which is not much different from any wide angle lens on 35mm. Longer optics such as the 80mm lenses and macros have less falloff but I haven’t measured the amount yet. I also have not looked closely at off axis pixel/sensor effects though they do appear to be very minor in the scheme of things. The manual says to read the light meter with the adapter centered both shift and tilt. This is because off axis light rays, especially with tilt, affect the focus screen differently than the sensor. There can be up to a four stop error in exposure (over), depending on the amount of off axis movement. This is probably no different than with any tilt/shift lens. When used with a chipped adapter, you can use ” A” mode, let the camera pick the shutter speed, press the AE lock and then shift the lens to taking position. Of course, there is no automatic stop down of the Mamiya lenses with the adapter. You normally view wide open and meter and shoot with the lens stopped down to taking aperture. I actually shoot a lot with the lenses wide open or stopped down to f/5.6 so viewing is not a problem for the most part. Mico could probably squeeze a cable release socket on the forward part of the adapter if they put their thinking caps on. Mamiya 645 lenses do have a M/A switch toward the rear, which does about the same thing. The Mamiya 645 system was in production for something like 30 years and has a wide selection of lenses for any purpose. Lenses of interest for landscape/architecture with the Mirex are of course the 35, 45 and 55mm wide angle lenses. For tabletop, product and macro work, the 80mm f/2.8 normal and 80mm f/4 macro would be useful. An APO 120mm 1:1 Macro is also available. The world’s fastest medium format lens, the 80mm f/1.9 is very handy for creative work with shallow depth of field. There is even an excellent 55-110mm zoom lens. For the time being, these lenses are all reasonably priced and available (used). Believe it or not, most of the testing of this adapter was with the setup used handheld. While you can of course use the tripod socket on the camera, an additional rotating adapter that allows using a tripod on the lens would be ideal. There are adapters available to fit Hasselblad, Pentax 6X7, Bronica, and Pentacon 6 lenses to Mamiya 645, so potentially there are scores of medium format optics usable with the Mirex. I will be doing some testing of the Mamiya 645 lenses particularly for corner sharpness, possibly in a part 2 posting. From early results, sharpness appears more than adequate for most purposes. While I first balked at the cost of the adapter (294 Euro), what is the alternative for Sony cameras? Dedicated lenses are available from Hartblei, etc., but none including tilt and shift are shorter than 35mm and their cost is more than twice as much (not including lens cost on the Mirex). A single focal length lens from Sony if ever to be made would likely cost thousands. This adapter allows use of multiple purpose lenses, albeit with totally manual control. If you already have some Mamiya 645 or other medium format lenses, this adapter is a no brainer. If you don’t have any lenses now, you may want to consider picking up the essentials before the price goes up. You could also pick up an inexpensive M645 body and dabble in MF film. cool! thanks for that review. i've been tempted by one of these. i wanted to play with depth of field, so i got a cheap lensbaby, but those really only do in specific scenarios. this looks to be a good option, and you've given a good review. thanks again. Wow, the build (except of course the tilt lock) is much better than I expected -- I'd seen the adapter on the internet a couple of times while looking for other adapters, but I assumed it would disappoint. Looks like a better product than I would've guessed. Good review-- Thanks! Excellent review! Thanks very much for posting this. I've never used a view camera or t/s lens but am interested and this seems like a somewhat reasonable cost option. Could you tell me what size filter threads the 35mm Mamiya lens has? Is vignetting likely to occur on an A900 with this lens if filters are used with extreme movements? Thanks Pete for this excellent review. I have a whole collection of Mamiya lenses (and a 645 body) so I am very tempted by this clever contraption. I understand that you have to use the Mirex in combination with a M42 adapter. Is that right? I there a M42 adapter that you recommend? (there seem to be quite a few). Thanks, that's what I was hoping. I thought it might be larger since the lens is for 645. Thanks for a great review, and another tilt/shift option for Alpha mount I didnt know about. What is the exact cost of the adapter?. You mention €294. On the WICO website the price for a tilt-shift Mamiya/M42 is €350; the price for a shift (no tilt) Mamiya/M42 is €289. Thank you very much, very useful review. Sorry if this question is a bit stupid, I wonder is there an adapter which would take Mamiya RZ 67 lenses? Not a stupid question Param. I don't think there is a RZ or RB67 to M645 adapter made yet. While the lens to film registration distance is huge on the RBs, focus is by bellows on the camera. 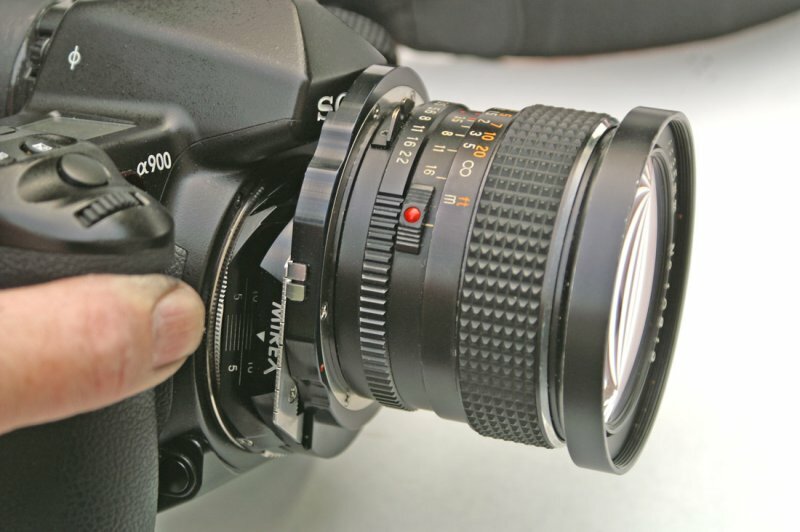 There is no focus helicoid on the lens like the M645 lenses, so the adapter would somehow also have to focus the lens. 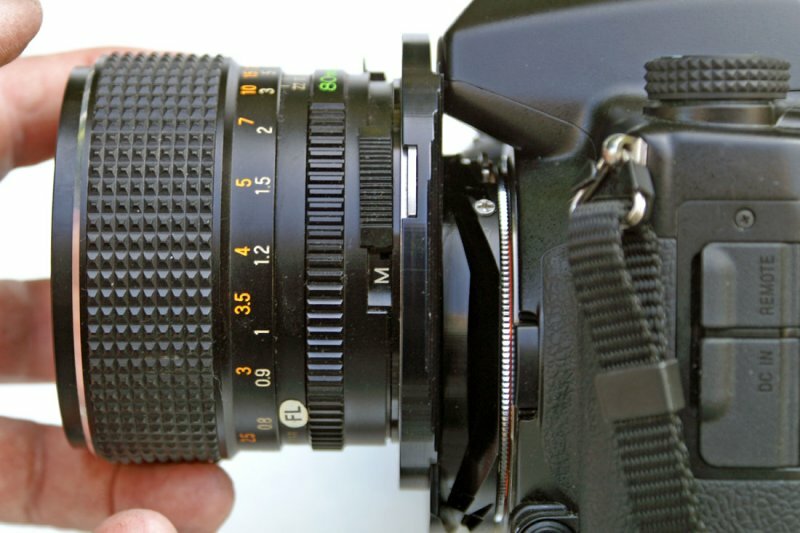 The mechanical shutter in RB lenses is open when you remove the lens from the camera and most lenses have a stop down lever for aperture control, so it is possible. The shortest rectilinear lens for the RBs is 50mm so that also might be limiting for what you need a Tilt/Shift lens for. Obviously, image circle size is not a problem. They are big, heavy lenses considerably larger than M645 lenses. Maybe they have already jacked up the price since I bought mine in July. The invoice I have lists the T/S M645 adapter at 294 Euro with 72 Euro for shipping and handling to the US. Maybe they can be picked cheaper in Europe. I would contact them for the current price. Yes, they are big. I was asking as have several of RZ lenses resting of a shelf. 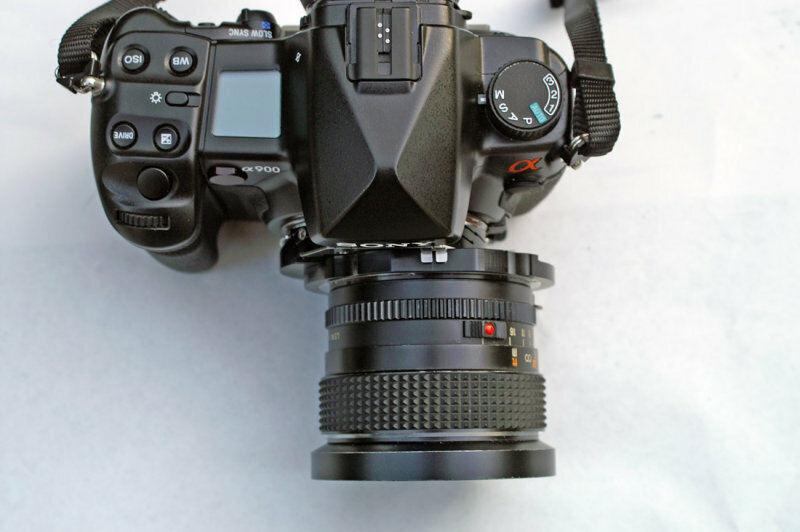 Still, the best would be to have such an tilt/shift adaptor for Minolta/Sony lenses. Hopefully miracle will happen soon. Thanks Pete for the excellent review. I have just ordered one, the company now accepted paypal. Mr. Markus Michelberger is very nice and responsive. It took about 4 days to ship straight to Hong Kong after I made the payment.